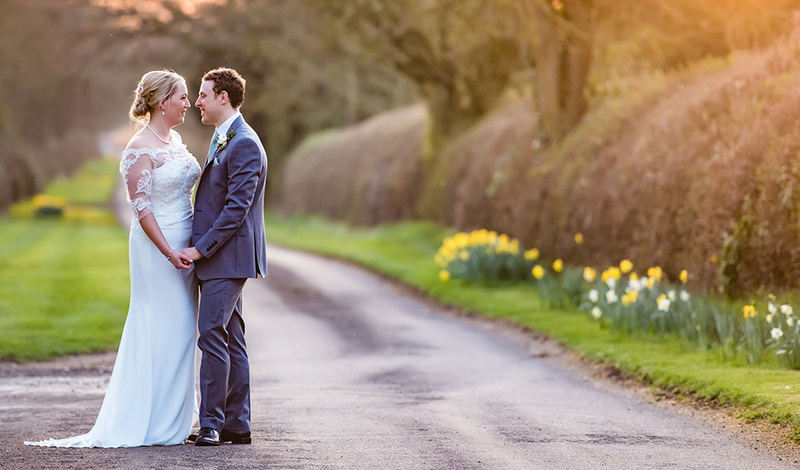 Emily and Tom just adore spring and knew they wanted to celebrate their wedding in their favourite season. 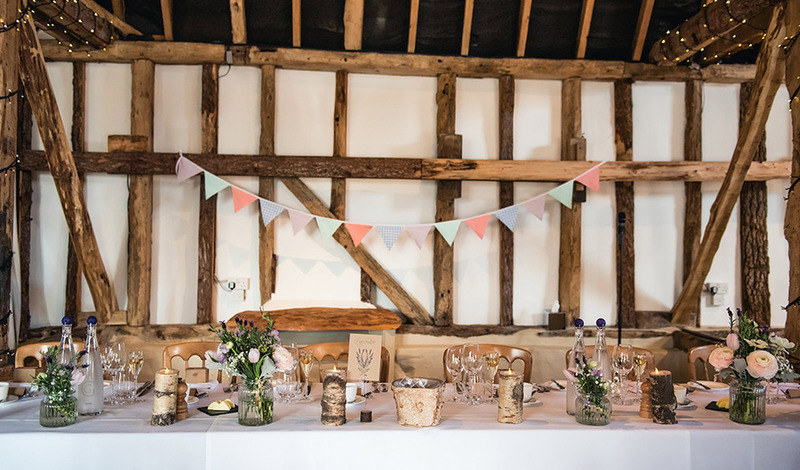 They also love good food and good times so Clock Barn was the perfect venue for their big day. 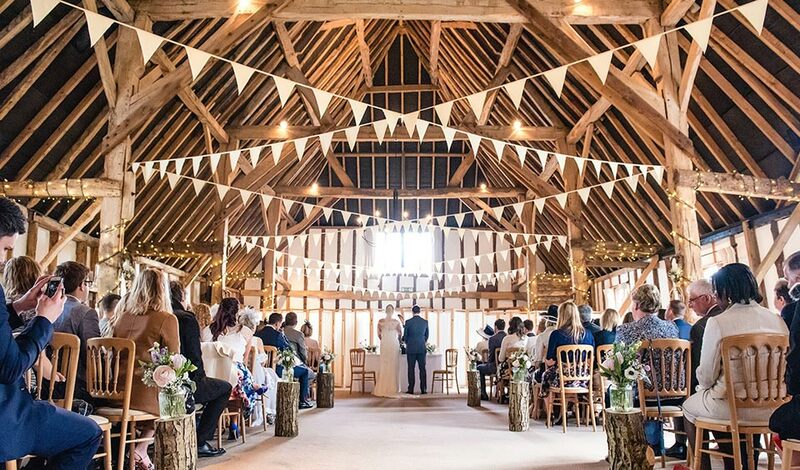 “We chose Clock Barn as we wanted somewhere we could have a beautiful wedding inside or outside. 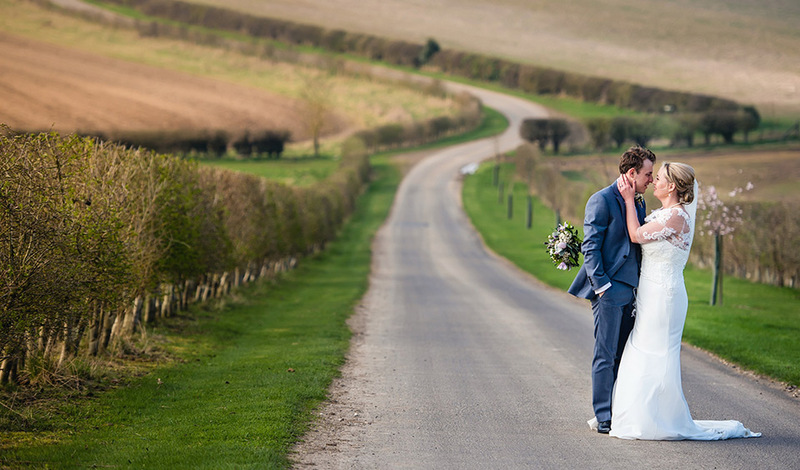 I loved it when we drove up the long driveway – you get a sense of occasion and we could imagine our wedding guests starting to get excited as they came up to the entrance.” – Emily. “We wanted a few chops and changes to the packages which up front they said not a problem. 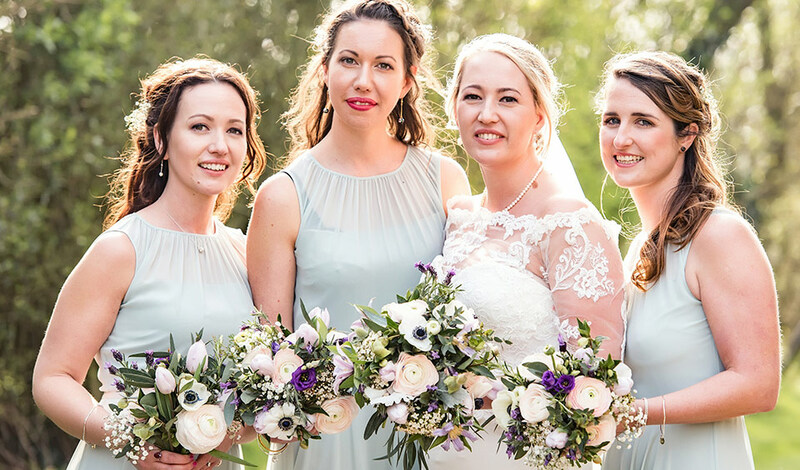 They want to work with you and they understand there is no cookie cutter mould to a wedding and it can be personalised and made special.” – Emily. 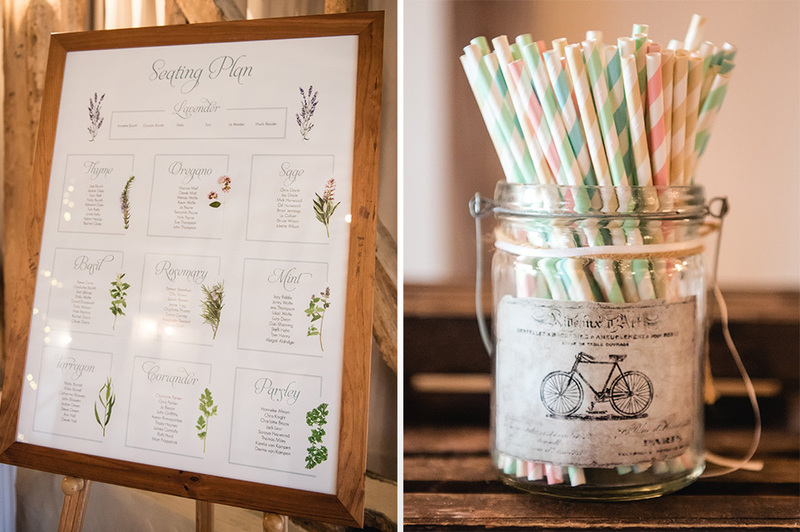 Emily and Tom chose a fresh English Country Garden theme and took a lot of their influence from herbs. 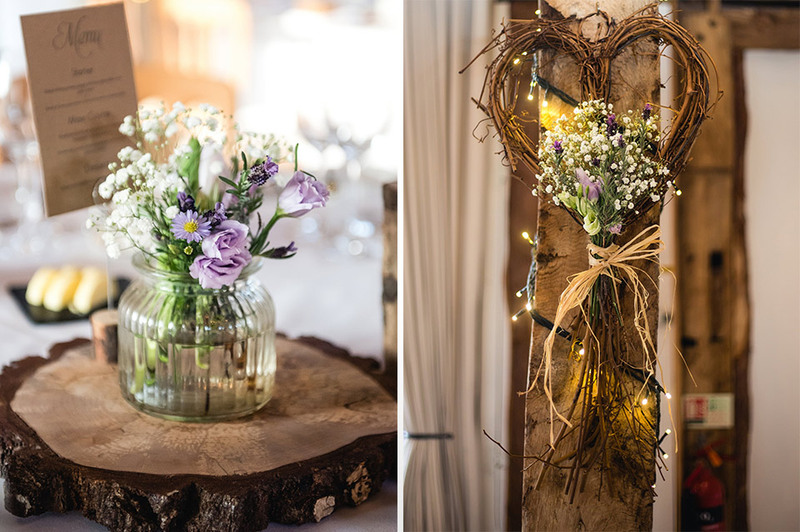 Jars filled with flowers by Effie Fahay sat on the wood slices on the tables, there were wicker hearts with gypsophila and raffia hanging around the barn and logs with flowers marked out the aisle. 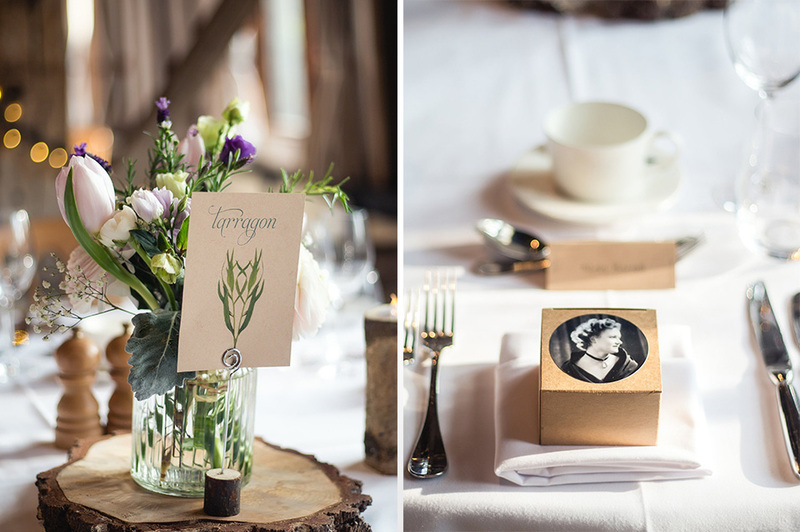 Tom also created the table names, place names and the boxes for the wedding favours. These held a picture of the bride’s Granny, her shortbread recipe and a shortbread cookie baked by the bride’s Mother. This was a lovely tribute to Emily’s beloved Granny. 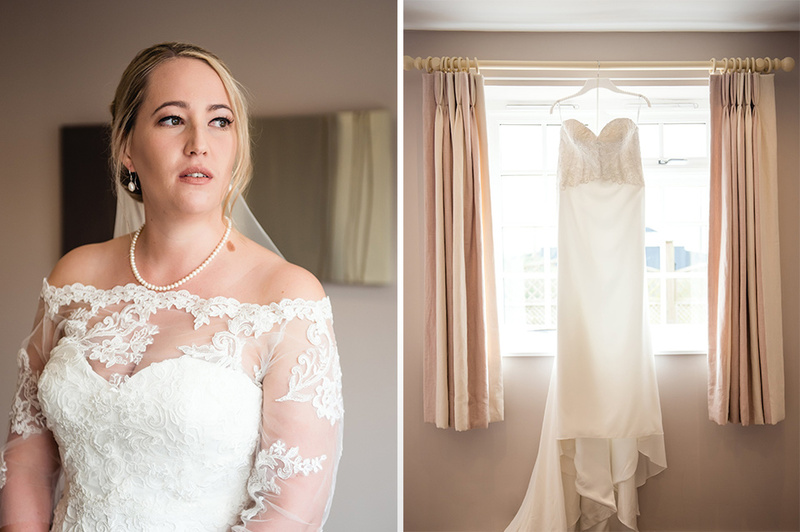 Emily accessorised her look with pearl earrings, a pearl bracelet and a pearl necklace that she’d bought in Vietnam whilst on holiday with Tom. 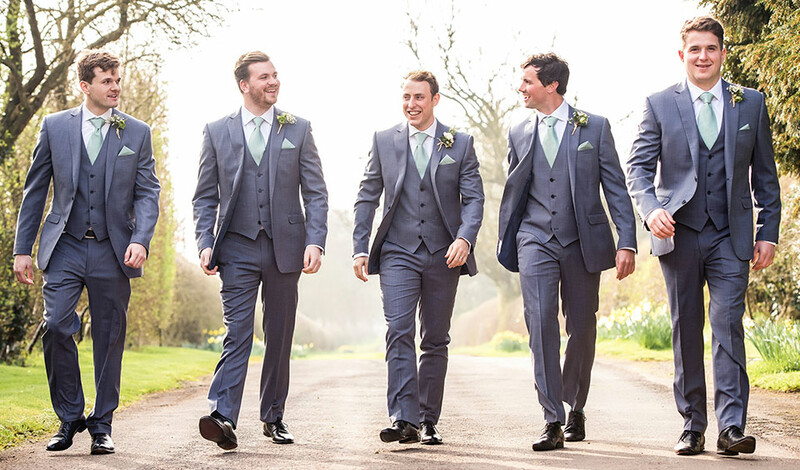 The groom and ushers all looked very dapper in tailored suits from Moss Bros in a fabulous blue/grey tone with mint green ties and waistcoats. 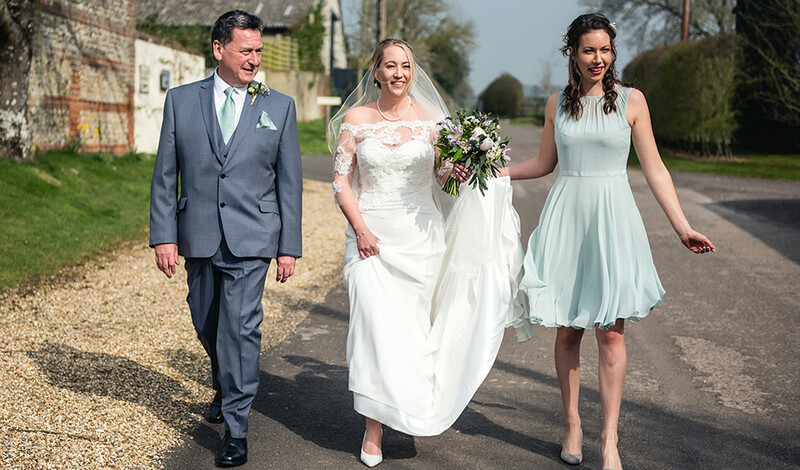 Emily’s bridesmaids wore Hobbs dresses in soft mint with silver shoes and gypsophilia in their hair. 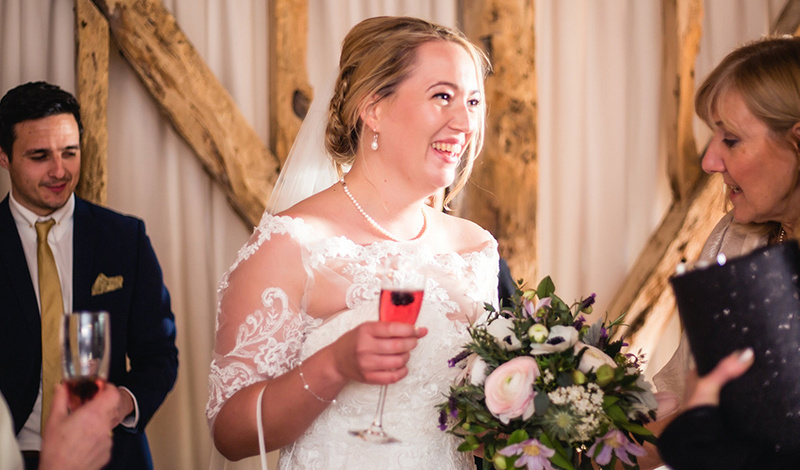 After their vows, the happy couple celebrated with mouth-watering canapés and drinks which went down a treat with their guests. 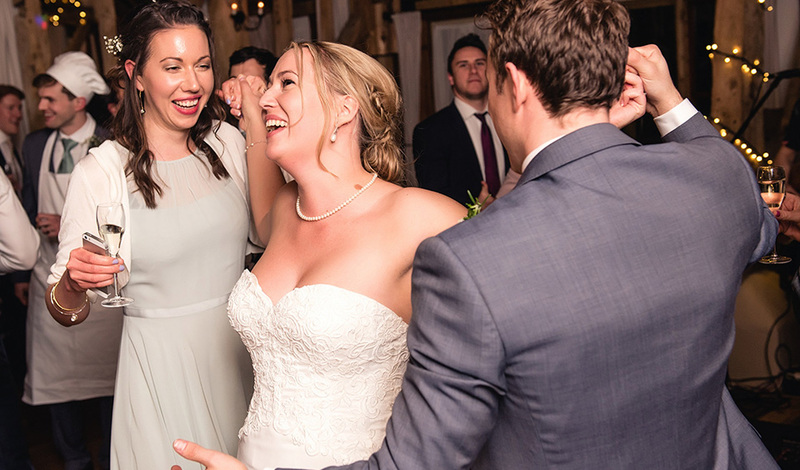 “Drinks were served on the dance floor with guests enjoying six different canapés, all of which were amazing, while sipping delicious cocktails and Prosecco.” – Emily. The wedding breakfast was exactly the delicious feast that Tom and Emily had imagined. Guests were served ravioli of king prawns to start and this was followed by a sharing board main course of roast fore rib of beef – guests were provided with chef hats and aprons to serve themselves! 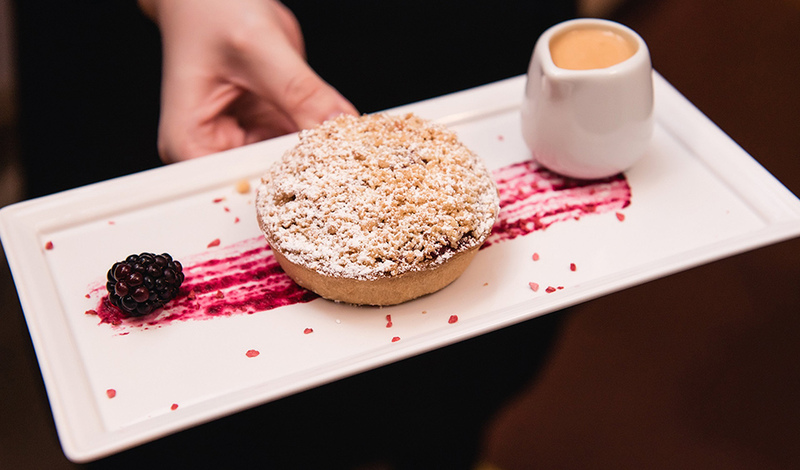 An apple and blackberry compote was the perfect ending to the meal. “For me, the standout dish was the starter but the beef had the most compliments – people couldn’t believe the quality and the fact that it was served medium rare was beautiful too. We picked food we like to eat and so many people came up to me and said it was the best food they’d ever had at a wedding.” – Emily. The edible treats didn’t stop there – the couple served wood fired pizza in the evening and their cake, which had been made by a friend. 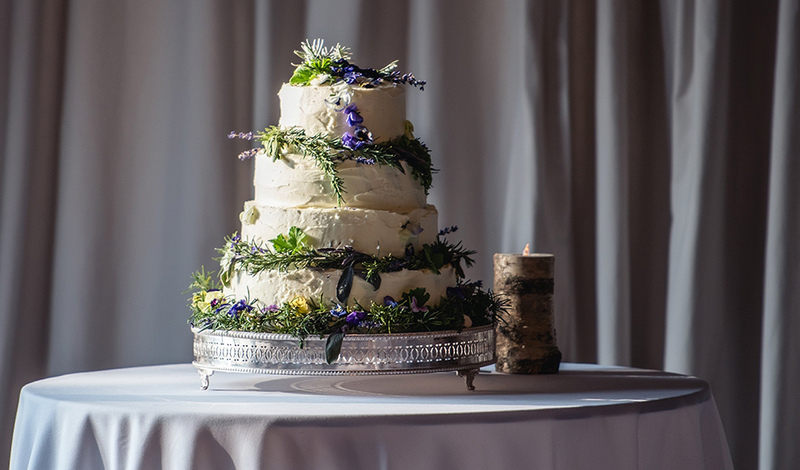 The cake included lemon, fruit, banana and carrot cake layers and was decorated with white buttercream and herbal garlands, edible flower petals and herbs. 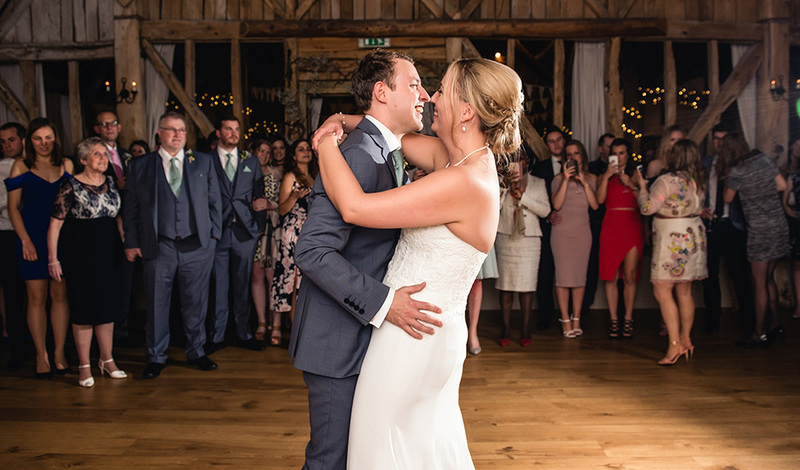 Emily and Tom started the evening party dancing to Ho Hey by The Lumineers and then the band The Confidentials (booked through Function Central) played all night and were described as ‘awesome’! 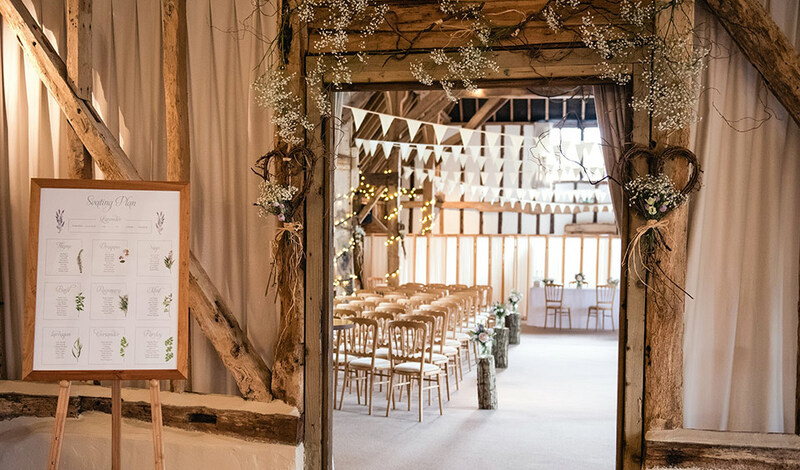 If you’re looking for even more wedding inspiration, then make sure you take a look at these incredible Spring Wedding Ideas For Your Ceremony and see the beautiful ways you could make Clock Barn your own.